Regardless of where you are in the world or what device you are using. If you can access the internet your Bulk Email Checker Control Panel is online and ready to verify email addresses. The Email Checker test is SMTP based, which provides the highest accuracy and additionally contains a lot of useful information to validate/verify any and all email addresses. Please enter an email address and click verify to see exactly what our Email Checker tool can do for you. 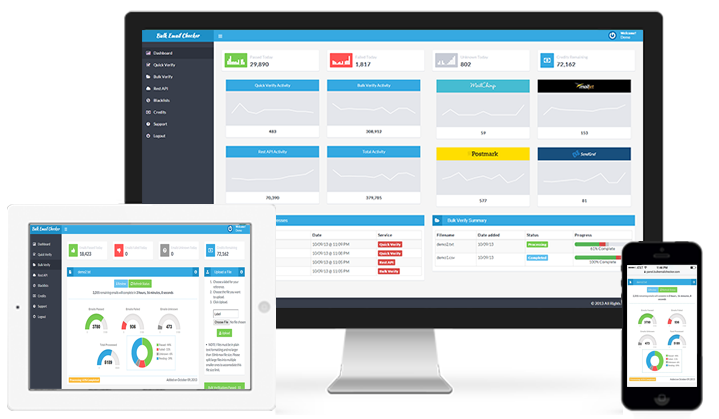 Test up to 10 email addresses per day for free. Please enter the email address you would like to verify. If you use any of these services to send your emails, you can copy and paste a single link into your account to quickly integrate the blacklist tracker. When these company’s receive an error (bounce, spam, etc) from sending your email, they will instantly add the address to your Bulk Email Checker Blacklist to prevent it from finding its way back in your clean lists ever again, for free. What is Bulk Email Checker? 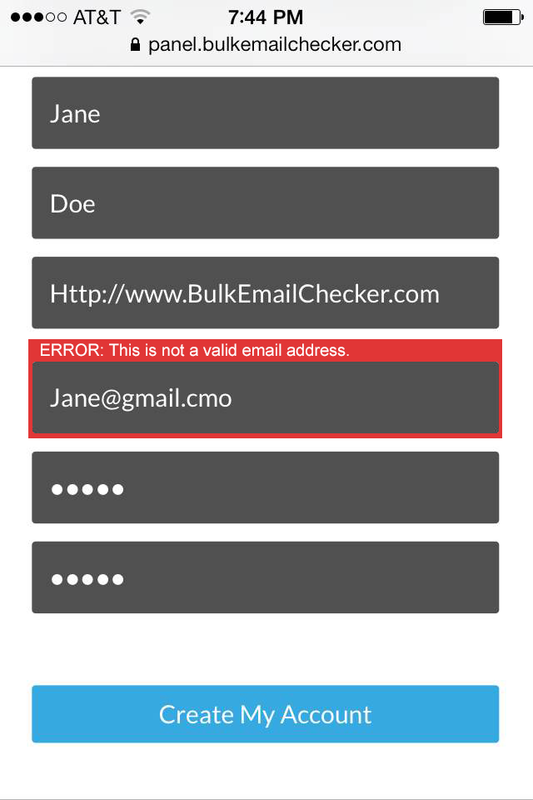 Bulk Email Checker is a web application that can verify if an email address is real or fake. Anyone who sends emails regularly can benefit from using the system. All email addresses are passed against a 17+ factor test. From being in a valid RFC compliant format and filtering duplicates to a deep cleaning SMTP test that is very accurate. How can I verify emails? The bulk verify system allows uploads of any plain text csv or tab delimited list of emails to be bulk verified or the Rest API can be integrated directly into your website or application. While our competitors charge on average $0.01 per verification, we give atleast 10 verifications for that same penny. Verify 10,000 email addresses for just $9.95. The Bulk Verify system allows you to upload a plain text file such as a CSV or tab delimited list of email addresses to be verified. First the system will remove all duplicates from your list and verify emails are in RFC compliant format. Next all emails are filtered against a constantly updated list of 780+ disposable email providers and your accounts blacklisted addresses to remove any previously failed addresses for free. The system will also check for invalid dns entrys and filter role accounts. Last the system performs a deep cleaning SMTP test that will connect to the destination mail server and check if that mailbox exists and is able to receive mail. Lets face it, people misspell their email addresses and are completely unaware of it, resulting in a delivery failure due to a bounce or maybe even a spam complaint and you also just lost a potential customer for your business. What’s very interesting is most of these invalid email addresses are a result of simple misspelled domains such as “hotmail.con”, “gnail.com”, “yahoo.cmo”. Integrating the Rest API into your website or application can prevent these issues from ever happening by alerting the user there was an error and that they have entered an invalid email address. Integrating the Bulk Email Checker Rest API to verify emails that are signing up to your account creation or opt-in forms can instantly decrease your confirmation email bounces by 50%+. The Rest API performs the deep cleaning SMTP test as well as filters against disposable providers and your blacklisted addresses. We understand your data is extremely important and security is at the top of our list. 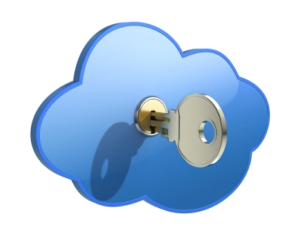 We use industry standard security practices to ensure your data is protected and secure. Bulk Email Checker is behind a Secure Socket Layer which means all data you transmit to the website is hidden behind 256 bit encryption. All imported lists that you upload to your account are stored in an independent container that only your account can access. Additionally all of your data on our servers is encrypted via our in-house 2 way encryption methods that ensure your data stays safe at all times by only allowing your account access, not even our staff can see your data. 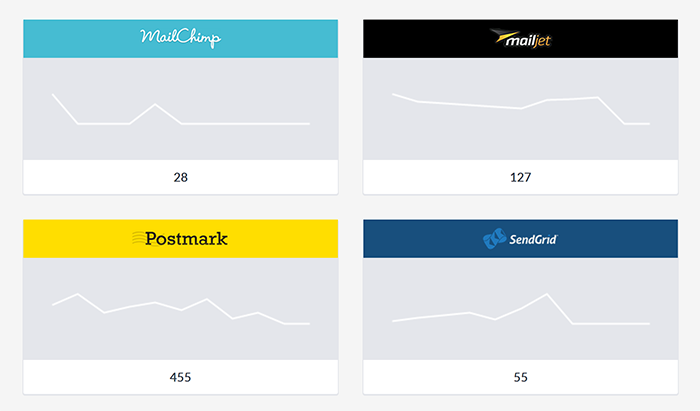 Are you using MailChimp, Mailjet, Mailgun, Mandrill, Postmark or SendGrid to send emails? 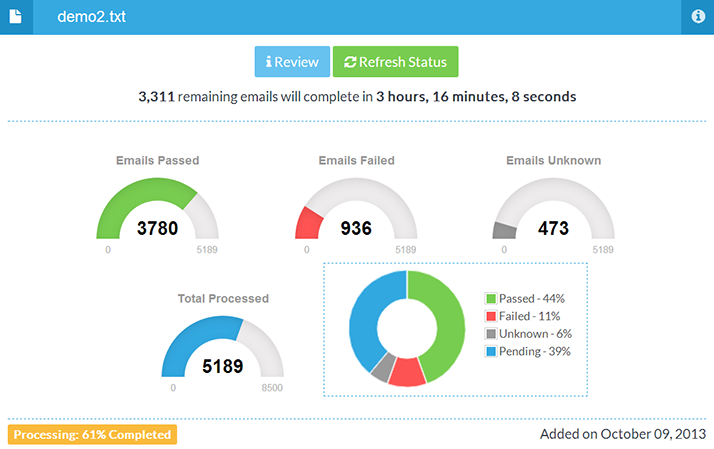 Each service seamlessly integrates with your Bulk Email Checker account to provide additional protection. When sending mail from these services any bounces, spam complaints, unsubscribers, basically anything harmful to your sender score is instantly added to your Bulk Email Checker blacklist to prevent the email address from making its way back into your clean lists ever again. If the user has a change of heart you can easily remove the blacklisted email from your control panel. The system will also keep track of any addresses you have verified as failed to ensure you are only paying to verify new never before seen email addresses. All blacklisted emails fail for free and will not consume any credits when verified. If you use Google Sheets to manage your spreadsheets, you can easily integrate Bulk Email Checker in a few quick steps. Our Rest API offers an XML response when requested which allows you to verify email addresses directly from within your spreadsheet on Google Sheets. Prevent spam and lost customers in comment, user registration and contact forms using Bulk Email Checker’s WordPress Plugin. If you run a WordPress website you can seamlessly integrate our system within just a couple minutes. Never lose a valuable lead or customer again due to an incorrect email address being typed in. Alert the user to the invalid email at the point of contact before they ever leave your website. All payments are a one-time fee with no hassles, no contracts and no strings attached.